Ok, y’all – I’ve talked with you before about one of my go-to decorating staples and about how easy it is to decorate with something as simple as jute twine. Now let’s talk about something else that’s super easy and affordable – paint! Spray paint, that is! There’s nothing really earth shattering here – we all know the amazing power of paint to transform just about anything. I just want to sing the praises of my favorite color and share just a few of the ways that I’ve used it in my home. In fact, if you’ve been a follower of Worthing Court for a while, you may already know that my most favorite spray paint color is Rustoleum’s Anodized Bronze. I try to always have several cans of it on hand in my spray paint cabinet. And no – this isn’t a sponsored post, but it ought to be! You’d never guess it from the name of the paint color, but Anodized Bronze is actually a medium dark shade of gray. I recently had a sweet reader comment that from the name of the paint color and from looking at the cap on the can of paint, she couldn’t believe what a lovely shade of gray it actually is! The first place that I ever used this color (and subsequently fell in love) was on the two end chairs at my breakfast room table. Then came the shutters (which are really cut up bifold doors) hanging in my dining room. As I said, Anodized Bronze is a medium dark shade of gray paint. 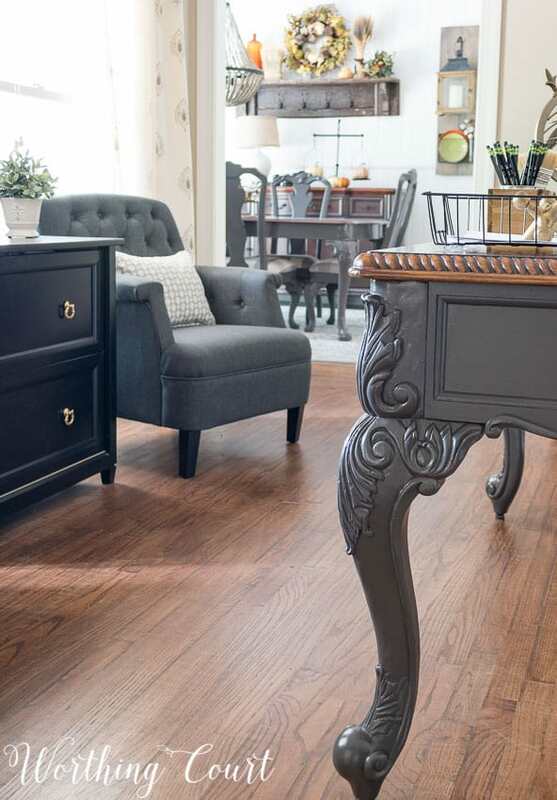 Some grays have a cold look about them, but Anodized Bronze is a warm gray that works wonderfully with brown furniture. In my mind, there was no better choice of paint color for the furniture in my dining room. I spray painted the chair frames, but the table and sideboard were too heavy to lug outside to paint, so I took a painted scrap of wood to the paint store and had them color match it for me. Bingo! On the sideboard, I cut the paint to about a 50/50 mix with water. CORRECTION: The correct paint ratio that I used is roughly 1 cup of paint to 1/2 cup of water. It gives some variety to the furniture in the room and allows some of the grain of the wood to show through. I used it again to paint the legs of our desk while working on our office makeover. See the painted dining room furniture through the opening? That’s an added benefit to using spots of the same color throughout my home – it helps to tie all of the rooms together and to give continuity to the feel of my home. And most recently, I used Anodized Bronze to paint the frames of a pair of benches that Pookie and I built for our foyer. I’ll be sharing the tutorial for the benches soon! As I continue with the room makeovers in the rest of my house, I already have places in mind that I’ll be using my favorite color! Does that make me a crazy lady??? 😀 Do you have a favorite color of paint that you’ve used in your home? Love the paint scene on the recycle desk and the barn door bookcases. I definitely will be collaborating with my hubby on the bookcases. He had already made the ladder following your directions. Oh my the way my daughter saw it and now is the proud owner of his second ladder. It IS such a beautiful color!!! Never thought of grays as being on the warm side. But, this works on so many levels!!! Thanks! I Love the color! Looks wonderful. I love the color it blends so nice with natural wood. It will be ordered today. Thanks for Sharing! I will definitely be trying this color soon. I love the color and all of the ways you’ve put it to use! It looks fantastic on everything! And I’ve said it before but I’ll say it again … I love, love, LOVE the rug in your dining room. Spray painting is tricky to apply even coats so it makes it’s much simpler to match the color using brush on paint, thanks for the GREAT tip! As always I love your decorating talents; while you use neutral colors, it’s not what I consider sterile white all over! I love how you did the 50/50 color in the dining room! What a great way to give some variety. Ready to go shopping and get a project started now. Thank you! Love that colour, thanks for sharing it! Can you tell me where you found the grey Buffalo check fabric that you have used in several places? I can’t seem to find it anywhere and it’s gorgeous! I would never have thought that you spray painted the furniture! It looks awesome!! Thank you. I would have never guessed that you used spray paint! The color of the spray paint is beautiful. Thanks for sharing it with us. Wow!! Looks great!! But I always thought that your furniture looked black, which I love. Great color! I Love all your ideas. I’m starting to go room by room and redecorating. I have just a couple small things to finish up in my first room; dining room. Thinking about what room to do next. Have you done any of your bathrooms? Hi Debbie. We’ve removed wallpaper, replaced flooring, toilets and countertops and painted all of our bathrooms, but the only bathroom that we did a major remodel in (shower, tub, etc) was our master bath. I haven’t taken the next step in them yet, which is to give them their cosmetic makeover, but I will! The next room that I’ll be working on, after the foyer, will either be a guest room or our hallway bath. I have actually used that paint and color on an outdoor metal table and chairs and LOVE it! You may have just answered my prayers! Who knew it would be in the form of spray paint! When the rain slacks up I’m heading to the store! Thanks for sharing! Love that color — two questions. What brand of paint for the color match and what color is on your dining room walls. It is so hard to find the right beige neutral beige! Hi Gersch. I know exactly what you mean about the difficulty of finding the right beige! I used Sherwin Williams paint on both the walls and on the color matched furniture. The walls are painted with their Resilience interior latex and the furniture is painted with their Duration interior acrylic latex line of paint. Off to the store to find this paint color! I had no idea that you had spray painted the furniture! Love it! I have been admiring this color in your home and I am so happy that you have shared it today. Now I just have to find something in my home to paint! Love it all!!!! Can you tell me where you purchase the black and white stripe canisters and pitcher? I have been looking all for some and cannot find them anywhere. Thank you so much! Hi Cristi. I purchased my canisters at HomeGoods. I’ve searched all over the internet numerous times and have been unable to find anything similar to these. So sad! 🙁 I’m surprised that no one seems to be making them because black and white stripes are classic and everyone is loving that look right now! Hi Suzy, me and spray paint don’t get along, but I love the color. my question is what paint did you use to color match the spray paint, and do you have a tutorial with brands and finishes on your furniture makeovers? 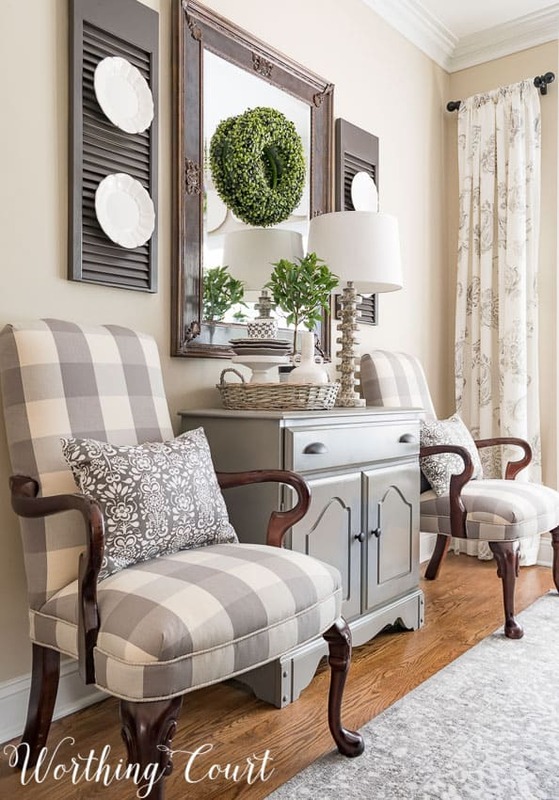 Your furniture is gorgeous, and I agree using the same finishes from room to room makes things flow and also mix and match if you need or want to change things up. Hi Debra. I used Sherwin Williams Duration Interior Acrylic Latex to color match the paint. 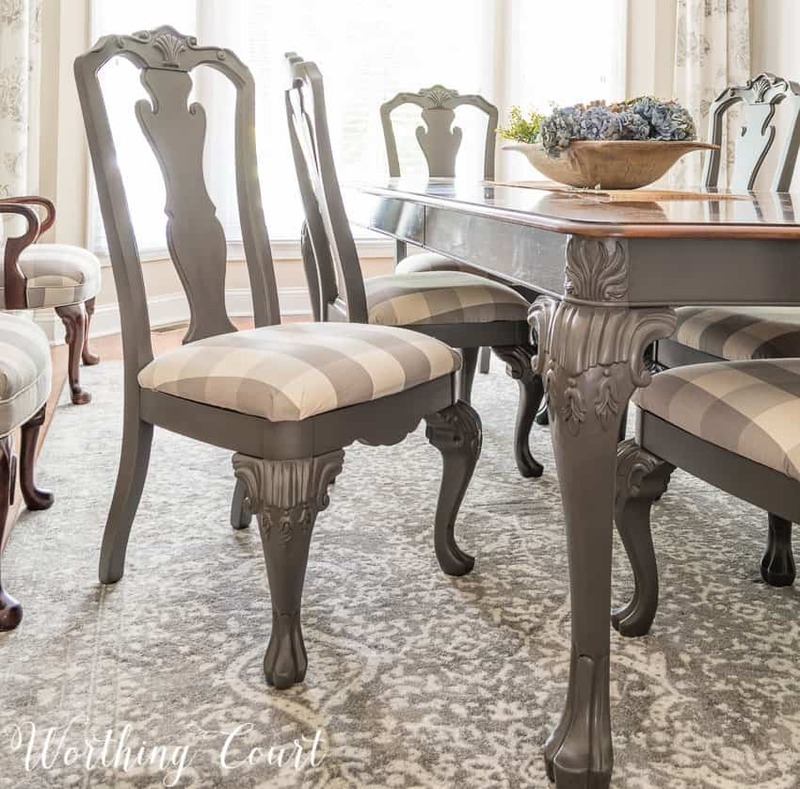 You can read more about how I painted the dining room furniture in this blog post: https://www.worthingcourtblog.com/dining-room-finishing-touches/ . Let me know if that doesn’t answer you questions though! How do you mix the spray paint and water 50-50? Would this color be good for vintage radiators? Everything you have painted with that color looks great! Thank you so much for sharing your paint color…I get so confused when looking at paints…Never knowing if it will be the true color…The Gray is just beautiful and so popular at this time…Love your blog…. Wow, I’m glad I brought up the color of your dresser under the stair landing. It sure brought up a lot of responses. I’ve been looking for this color for quite awhile. You’ve been more than generous in sharing with us your wonderful secrets. I’m going to keep coming back! Love your dining room as well as every room you’ve done. Am very glad you’ve shared the color. Do you remember what the first project you did with the paint is? No wonder you have used it over and over. Can’t wait to see what else you do to your house! This is such a perfect spray paint color. Based on your previous page about your desk, I purchased a few cans of this and plan to paint my console table. 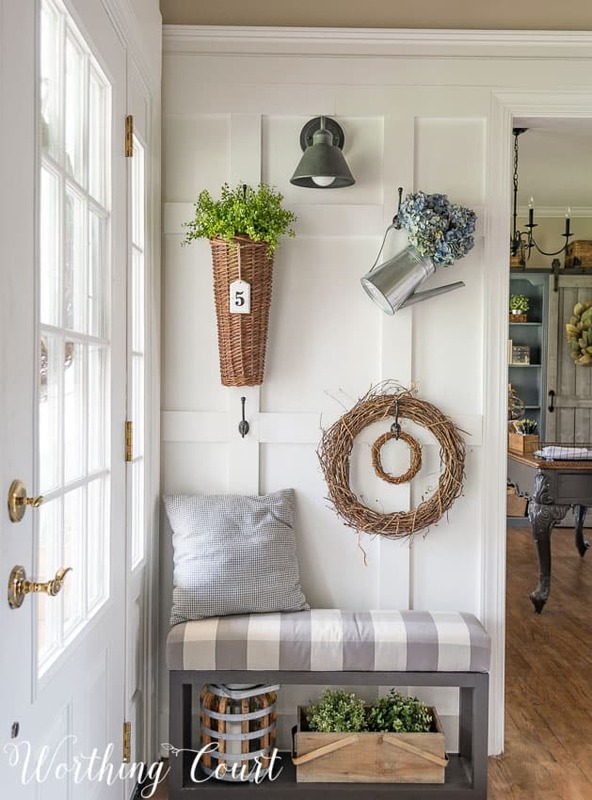 I love your farmhouse look! Whoa! Great color … but I never would have imagined a SPRAY paint doing that well! Tho’ you did get paint to match, too! Sometimes that escapes me … that they can match literally anything! Thanks so much for sharing. I’m filing this away … for the color and your process for the bigger pieces! Nope, you’re not a crazy lady, you are a smart lady! What a gorgeous color!! I’m getting ready to do a gallery wall and now have my frame color~thank you so much for sharing!!! Love the look of your dinning room. Please tell me where you got the rug. Suzy, based on this post I bought a couple of cans of this paint this afternoon! Your description is right on–a nice, warm gray. Thanks for the recommendation! I loved the paint upgrade.It looks expensive yet comfortable. That color is amazing! If you use the spray paint on wood, do you sand the piece first and also prime it? If so, what do you use for a primer? Thanks!! Hi Monica. If I’m painting bare wood, with no other paint on it, then yes, I usually will give it a light sanding first. I typically only prime bare wood projects, cause I’m lazy. lol Whether or not I prime the wood first depends upon the size of the project and on how porous the bare wood is. If it’s a small project, I usually don’t prime first. When I do use primer, I use either Kilz or Zinsser brand. If it’s a larger project, I’ll just use primer in a paint can, but if it’s smaller I just use spray can primer (same brands). Hi suzy- I paint furniture and am amazed at the results you’ve had spray painting certain pieces! Thanks for your willingness to share your design tips- I love your blog! I am inspired that you painted your furniture with spray paint. I love the color. I had to read this twice, I thought for sure I was missing something about “chalk” paint. LOL I love that you use spray paint. I do to. Have you ever noticed some bloggers try to make you feel like your anti chalk paint? I got a lot of negative comments once when I admitted to spray paint. I’ guessing now, people are more supportive, as spry paint has come so far. Hi Christine. That’s crazy! I totally admit to being a lazy painter and will use spray paint anytime that I can! 😀 Anyway, I love chalk paint and I have used it on several pieces of furniture and even on a wall one time. 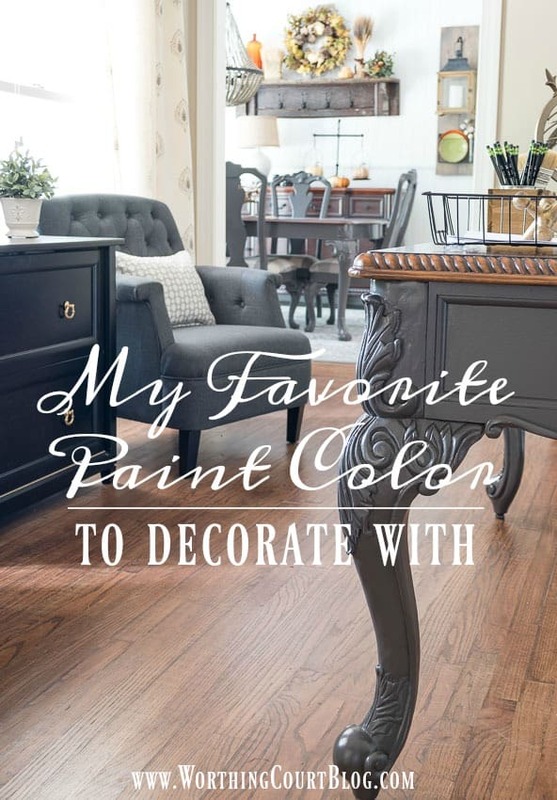 But – when I’m looking for a really smooth, non-rustic finish, I don’t use chalk paint. It those cases, spray paint or even paint from a can gives me a much smoother finish. I love this color. I would not have guessed the color from the name. I too love spray paint. I love looking at your house. It always seems so together. I love this paint color! It looks lovely in your home. I’m wondering how it will work with white and dark stained furniture? I am totally embracing farmhouse style in my home, and most of my furniture is white and/or dark stained wood. I’d love to incorporate some accent pieces in this color. Thank you for sharing. My favourite has always been ‘Hammered Pewter’ – I have ripped down any ugly bright brass thing I lay eyes on and sprayed it & every little thing looked better than it had since the 80’s. Love the look of moss! Thanks for sharing with us at Funtastic Friday!. Hi Julie. Did you see the email that I sent to you on April 3rd? Have used this color (and this brand) on some vintage metal plant stands outside, and am loving the way it looks on your dining furniture! Have decided there is a little too much antiqued/distressed/chippy white paint going on these days. And wowsers! 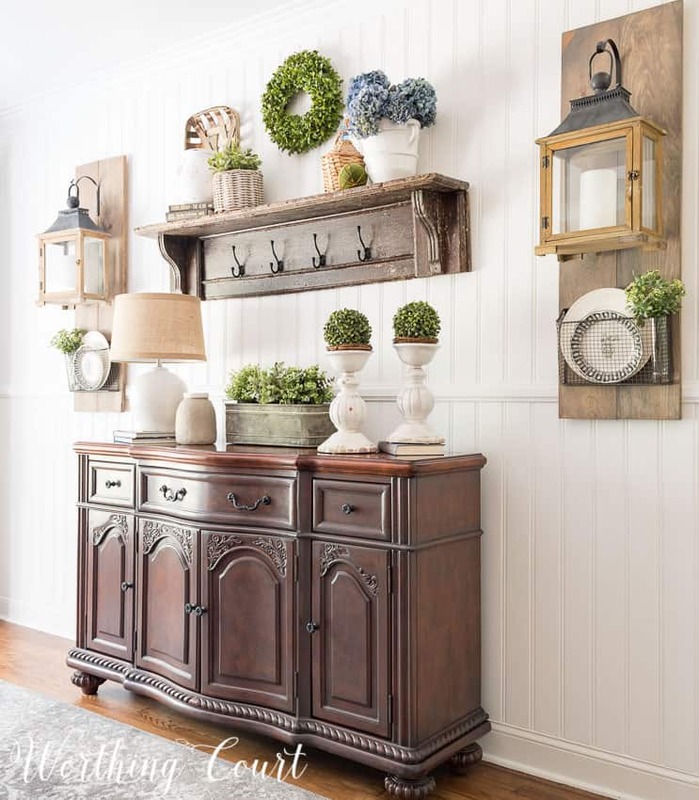 what a great look in your little foyer area!. So glad I “visited” today! Thanks so much for the paint tutorial. It gave me confidence to go and buy a little table I saw at a thrift store and am now going to paint. I never thought such a pretty color could come from a spray can. I’m definitely going today to find my new fav color in grey. I’ve already added this paint to my shopping list! Hope it looks as good on my project as it does on your furniture. New paint love color for me! Thanks for sharing, we all benefit from your taste and talents. I love this color and what a great find! I definitely want to try it, it may start a “revolution” in decorating at my home! Hi Suzy, had to look this post up to read it again! But tomorrow I am going out to buy me some Anodized Bronze spray paint, Not sure yet, what I will paint, but something. Hi Suzy~I fell in love with this color the first time I read this! I ordered several cans to paint frames with for a gallery wall. I sprayed a mirror frame this weekend and it came out more black than gray. The frame was already black and I didn’t think I’d need a primer first. Do you prime before using this gorgeous color? Hi Candy. That’s odd. No, I didn’t prime first, but it may be a good idea for you to if you’re still getting a lot of black showing through. Love everything you do and I mean that from the heart. I can’t find the andonized bronze spray paint at Lowe’s . Please keep us posted if you are every near High Point,NC. Amish TradingCenter and treat you to lunch😊💕✅. Hi Sharon. I only live about 30 minutes from High Point (Greensboro) and am over there often. I’d love to meet you! If you’d like to set a day, shoot me an email to: handgrs@gmail.com. We can shoot for next month, May. Suzy, What a brilliant idea, taking a paint sample to the store and having them make it up into a gallon of the same color!!! I know what my next project is going to be. Thank you for sharing! Love the grey! I may have to go with grey next. I have been using a sage green throughout my house. I am now moving to an efficiency apartment in a retirement home and will keep it in the neutral sage. Love your posts. So fun to read of someone else using spray paint on interior furniture! My go-to spray paint is Rust-oleum Flat Chestnut. It is an interesting brown/dark brown. I have used it on patio furniture, fireplace screen, fireplace tools, wall sconces, and now my dining room chairs. It looks good on everything! Actually, above mentioned Flat Chestnut is brown/dark gray! 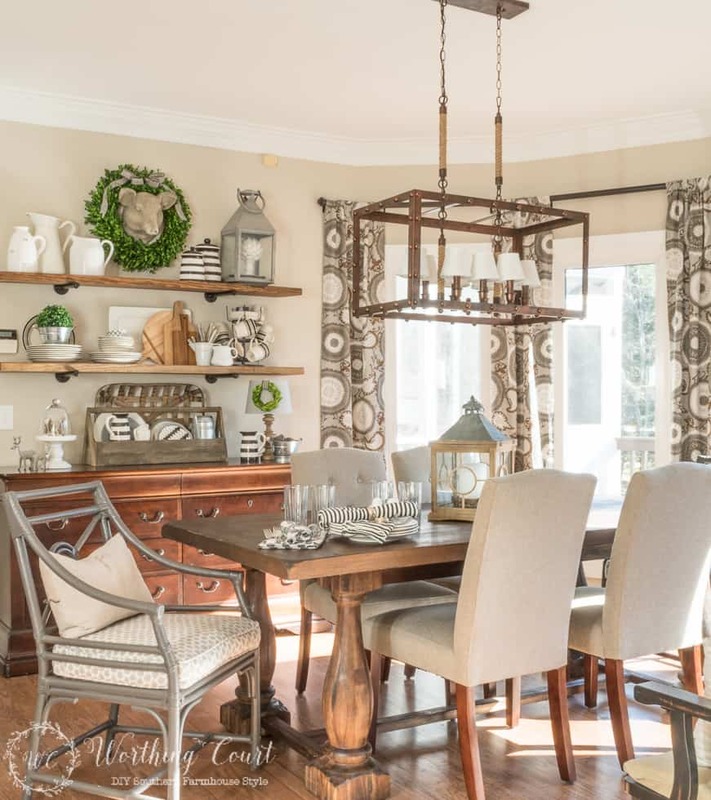 Love the look in your dining room! Will you share the color you painted the walls? I’m looking for a neutral, but don’t know if I want to go gray or beige. With your color, I can have both in the room.